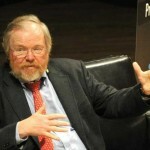 A special podcast with Mr Bill Bryson, author of A Short History of Nearly Everything. This science communication interview was recorded for the x-change, as part of my work at the British Science Festival 2012 in Aberdeen. So although this wasn’t specifically recorded for Speaking of Science, I think it was still a great opportunity, and a great interview with a humbly, kind and curious man.